In late 1970 the 568-acre Fairfax Campus of George Mason College comprised six buildings and a parking lot. The tiny North, South, East, and West Buildings opened in September 1964 and hosted classrooms, labs, administrative and faculty offices, and the dining hall. Fenwick Library and the Lecture Hall were completed in the fall of 1967. 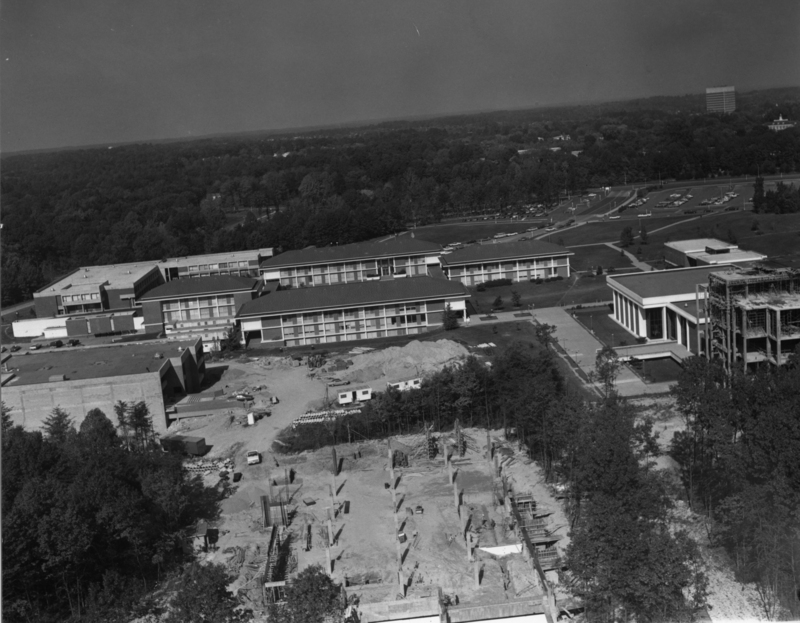 A seventh building, the Arts and Sciences Building, which was later named Thompson Hall, was still under construction and would not open until September 1971. The steady increase in enrollment, coupled with Mason’s ambitious expansion program, necessitated additional buildings. In 1970, a new wave of building began at Mason. Key buildings would begin to fill the first forty cleared acres of the original 147 given by the Town of Fairfax in 1959. Aerial photography of the campus from that era showed some kind of construction, no matter what year the photo was taken. At one point in 1974, three major construction projects within yards of each other (the Fenwick Library Tower, Robinson A, and the Student Union) were in progress simultaneously. Construction trailers and vehicles, steel framing, and large piles of dirt were an everyday part of the campus landscape for much of the 1970s. The first new building to appear on campus after 1971 was the Physical Education Building, known today as the Recreation and Athletic Complex, or RAC. Planning for this space, which included both an indoor gymnasium and outdoor field, began in 1968. In May 1970 a $1.5 million contract for the construction was awarded to the Sherman Construction Corporation, and the groundbreaking took place on July 16, 1970. Chancellor Lorin Thompson pushed for construction to be completed by the beginning of the fall semester in September 1971. However, progress was plagued by construction-related delays, and the building was not opened until July 1972. The P.E. Building was closed and completely renovated and expanded in 2008. It reemerged in April 2009 and was renamed the Recreation and Athletic Complex. By 1970, library administrators concluded that Fenwick Library was not large enough to be able to handle projected enrollment and collections growth that was to take place over the next several years. Library Director Patrick Larkin and Chancellor Thompson drew up plans for a massive five-story tower, which would be connected to the south façade of the library. The tower would provide much needed additional space for research, administrative offices, library collections and expanded library services. The Fenwick Library Tower would eventually open in November 1974 after library administrators closed down the library for several days to facilitate the movement of books and other materials into the new space. Student Union Building I, still one of the most visible structures on campus today, was in the planning stages in the early 1970s before groundbreaking occurred on February 29, 1972. The building cost almost $1.4 million to construct, and was scheduled to open in two phases. The first phase of the building, which included a lounge on the main floor and dining facilities on the lower level, was scheduled to be completed in 1973. The second phase, which added additional office space to the Student Union, would be finished in 1975. The Student Union Building was beleaguered by several small construction delays, and the first phase of the structure did not open until February 1974. Mason’s dining hall, known as the Ordinary, and the university bookstore, both of which had previously been housed in the East Building, found their new home on the lower level of the brand new Student Union. Academic II, later named Robinson Hall for the late George Mason College Advisory Board Chairman, Clarence Robinson, was the largest academic building to open on the Fairfax Campus during the 1970s. The building cost $2.4 million to construct, and its first phase, Wing A, was opened in July 1975. Robinson Hall figured heavily in University President Vergil Dykstra’s plan to move the entire population of the North Campus, Mason’s satellite campus located on Route 50, four miles to the north, back to the main Fairfax Campus by 1978, the date Robinson B was scheduled for completion. This would have indeed mitigated complaints among students, faculty, and staff there of isolation from the Fairfax Campus. Although Robinson provided a significant amount of classroom and lab space - it contained 28 classrooms, 14 labs and a 500 seat two-story theater - North Campus would remain in operation for another five years. As the finishing touches were put on the design plans for Robinson Hall, Wing B, another important campus feature located 150 yards to its southwest was beginning to take shape, the Student Apartments.